High output, Solid connectors maximize current flow for demanding applications. Robust integrated balance leads streamline battery installation and prevent damage to separate, fragile balance connectors. Quickly Recharged, 5C fast charge capable. 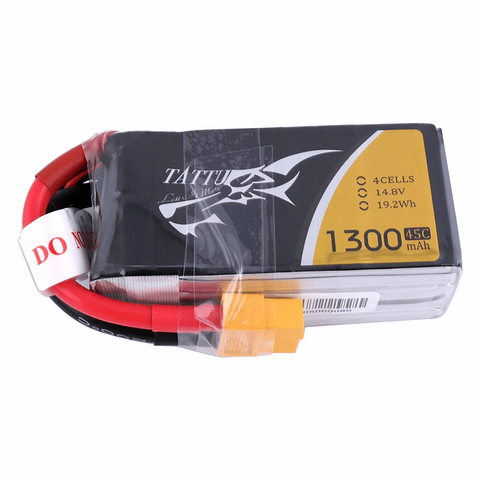 The Tattu 1300mAh 4S1P 45C 14.8V Lipo Battery Pack is�specially designed for Nemesis 240 Mini, Tweaker 180 Micro Quad, LRC Freestyle V1(270-296), MXP180 FPV Quadcopter, Danaus, Vortex, FLIP FPV 250S MINI, FLIP FPV 260H MINI, drone and FPV etc.